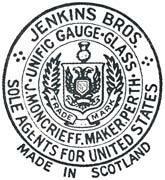 Jenkins Brothers were a US manufacturer of Valves, Mechanical Rubber Goods and US agents for Moncrieff Scotch Gauge Glasses. The following price lists for Gauge Glasses is from 5 pages taken from their 1933 catalogue. Jenkins took over the agency for Moncrieff from Rogers in 1925 and continued until c.1939. Jenkins Brothers were founded in 1864 in Bridgeport, Connecticut and in 1933 they also had another manufacturing plant in Lachine Canada. To ascertain the list price per dozen: Glasses longer than 72", multiply the list price of the 12" size by the length required in feet. No allowance is made for fractions of a foot. Lengths not regular, charged at price of next longer tubes of same diameter. Lengths not regular, charged at price of next longer tubes of same diameter.